This post is bending the rules a little bit, I’ll admit right out of the gate (but honestly, the rules were already bent on day 1 of SSM when I posted a short story by Tobias Wolff that was collected in a book that was obviously not released on a small press, okay). “i laughed so hard i fell down” is not technically a short story, but an excerpt from Fletcher’s novella, When All Our Days Are Numbered Marching Bands Will Fill the Streets and We Will not Hear Them Because We Will Be Upstairs in the Clouds, an exceptionally long title for an exceptionally good book. But! I contend that “i laughed so hard i fell down” stands on its own as a short story, so I’m making it a part of SSM. Like I said yesterday, I’ve been doing a lot of gardening lately, pretending to be a man of the earth. As of yesterday, I am now looking forward to the fruits of 4 strawberry plants, 4 raspberry bushes, tomatoes, red peppers, and a smattering of herbs. I was up all night drawing pictures of plants. I cut them out of the paper and glued them to some cardboard. I glued the cardboard to some paint stirrers and I planted them in the yard. I tried to make sure that there were some pretty good plants in there. I am building you a garden the best that I can. I built you a steamboat. I built you a window. I built you a river. I built a ship out of the floorboards and I floated it on down the river. I made the river out of what rivers have always been made out of. I believed in tradition as much as I could for all the ways it could help me and all the ways that it would. Sometimes I envy my brother, a steelworker. I know. If I spent a week doing his job, especially a week in the middle of January or August, I would absolutely hate it. But, what I envy about it is its tangibility. 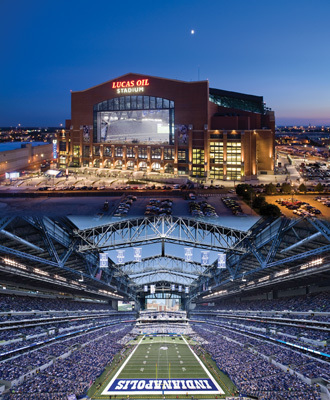 Take for instance the new Indianapolis Colts stadium. The Lucas is an engineering marvel. The structure itself is awe-inspiring and beautiful, which should be enough for my brother to take pride in being a major part of its building. What’s more, look how many people are there. At any given event, my brother can see 1,000s upon 1,000s of people enjoying this thing he helped create over the course of 3 years. There is something there that I envy. Making a life of writing and art has little of such tangible acknowledgment. We are creating objects for which a greater portion of the world’s population has neither care nor use. This is not me bitching. It’s a simple fact, and I don’t think I know a single writer or artist who hasn’t had the same romanticized notions of a simpler, more laborious profession. There’s a yearning there, in the song, in Fletcher’s story, in my chest, hopefully in yours too, to create something of real meaning and value to others, something as necessary to sustain life as food. Just as my brother holds to his tradition of a hard day’s work for all the ways it can help him and all the ways it will, I hold to my tradition of art, of storytelling. Because just as structures are necessary for humans to have a home, stories are necessary for humans to have a history. Good to meet you, too, and glad you’re enjoying the book! That sentiment is a strange one, sometimes it’s such a driving force, and sometimes it can feel really discouraging and abstract. dear champ, it actually was a short story, written before the novella, along with the other two pieces published before the novella that ended up in it. they were all written as stand alone stories that ended up being the same story anyway, so then i wrote them all together and outward. also, good lord, thank you. you’re welcome, man. thank you.